When I was planning my trip to Thailand, my friend and I wanted to see more of the country than just Bangkok. Since she is not a beach person, we decided to spend a few days in Chiang Mai. Our trip was in December, a time when the weather is nice during the day, not too hot or humid, and then cools off at night. 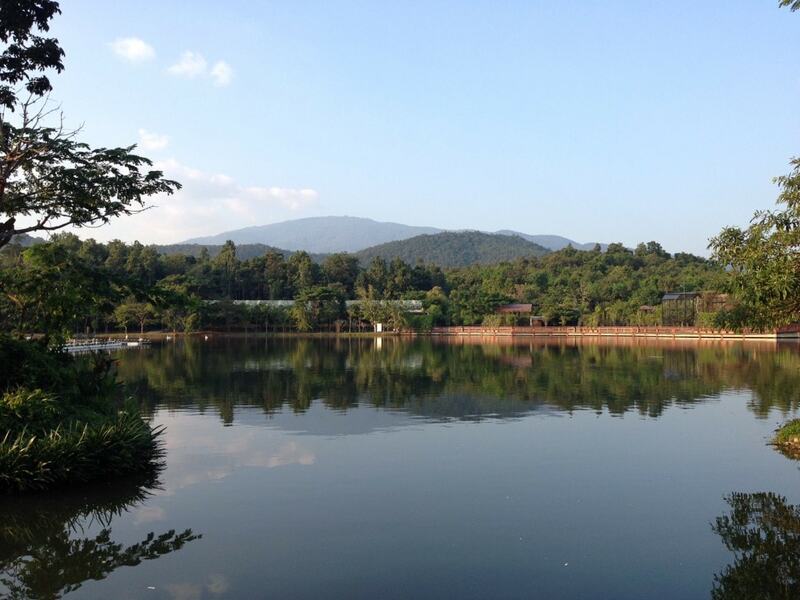 I really enjoyed my time there and was surprised with all the things to do in Chiang Mai. Note: This post includes affiliate links. See disclosure for more information. One of the things that inspired me to go back to Thailand was the food. I had a long list of foods to try in Thailand. I love the mixture of the spicy and sweet in Thai Cuisine. Since I also enjoy cooking, I really wanted to take a cooking class in Thailand to learn the authentic way to make some of my favorite dishes. We took a class in Bangkok, but it was a little disappointing because we had trouble understanding the teacher’s English. In Chiang Mai, we decided to do a private all-day class at the Thai Kitchen Cookery Centre that also included a trip to the market. This class was my favorite thing on our whole trip. There are many companies that offer similar classes, including the Thai Akha Cooking School Chiang Mai, but we chose the one that was recommended by the concierge at our hotel, the Dusit D2 (affordable and centrally located in Chiang Mai). We were picked up at our hotel, so we didn’t have to worry about finding the cooking school. When we arrived at the school, we were introduced to our teacher (who spoke perfect English) and then we got to choose our menu. We would each be making (and eating) five dishes. YOU MIGHT ALSO LIKE: The Best Pintxos Cooking Class Ever! Once we had decided on the menu, we were off to the market to do some shopping. We each got a little shopping basket and then our teacher showed us around the market, which seemed surprisingly clean. We saw the machine that made coconut milk, which was fascinating, and plenty of other unusual fruits and vegetables. Then all of a sudden it was time to leave. I was concerned because I had been just looking around and hadn’t even put anything in my basket. The teacher told us that was ok and as we were exiting they handed us new baskets with a couple of items in them. I would have liked to be able to pick out my own ingredients, but I still enjoyed exploring the market. Thai Kitchen Cookery Centre was a large open space with lots of burners and tables to work (and eat) on. There was also other private classes and one large group class going on at the same time. We made all the dishes from scratch, including making the curry paste for the curry. 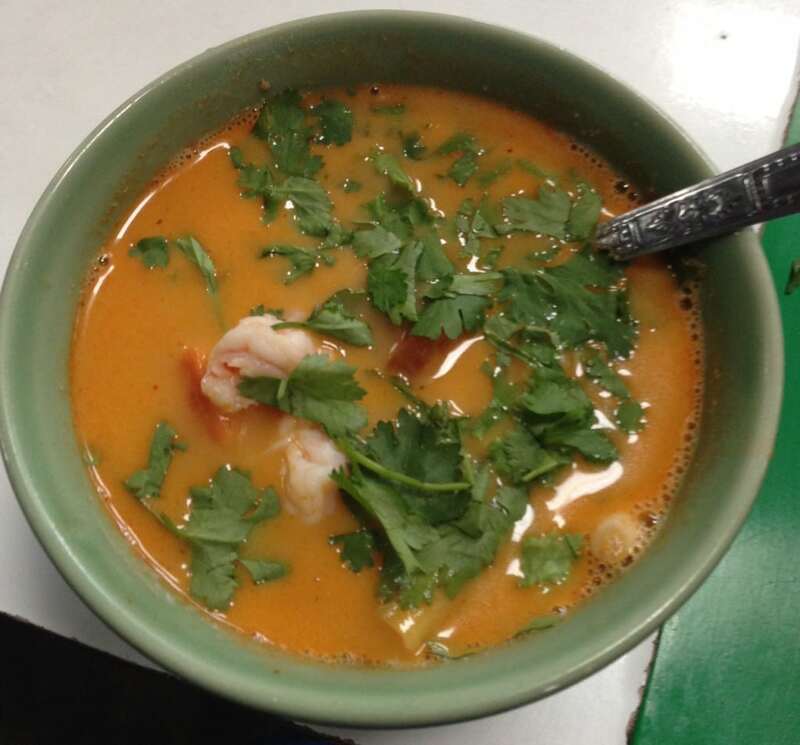 One thing interesting I learned is that most red curry has shrimp paste in it (note to vegetarians!). I would have never guessed it because I don’t think you can taste it, but look on the label the next time you buy some red curry paste. The food we made was excellent and we had a lot of fun making it. It was nice having our own teacher, so we could ask as many questions as we wanted and move at our own pace. Next time, I will have to try some of the best Chiang Mai restaurants! 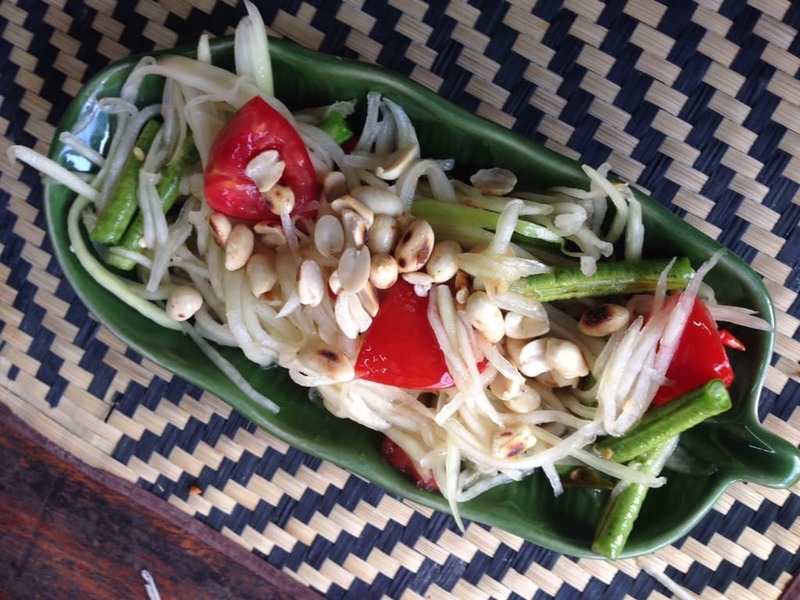 There are also many vegan restaurants in Chiang Mai. There are countless Buddhist Temples in and around the city that you can visit. We only had time for one, so we went to Wat Phra That Doi Suthep, which is the most famous. It was built back in the 14th century. The temple is located on top of Mount Suthep and has great views. In the temple, you can also see a replica of the famous Emerald Buddha. The original Emerald Buddha is now kept in Bangkok. Other Chiang Mai temples that you might like to visit are Wat Chiang Man, Wat Phra Singh, Wat Suan Dok, and Wat U-Mong. I had been to the Night Safari in Singapore, so I was really excited to go to the Chiang Mai Night Safari. Since it is about 30 minutes from the city, we took a taxi to get there. We arranged for a time for the driver to pick us up when we figured we would be ready to leave. We decided to go early since we also wanted to go to the Night Market that same night. On the way, we stopped at a temple on top of the hill, which was nice, but not as impressive as the temples in Bangkok or the White Temple in Chiang Rai. We got to the Night Safari in the afternoon and at that time it is like a regular zoo. After we had walked around the grounds, we went to the lion show. 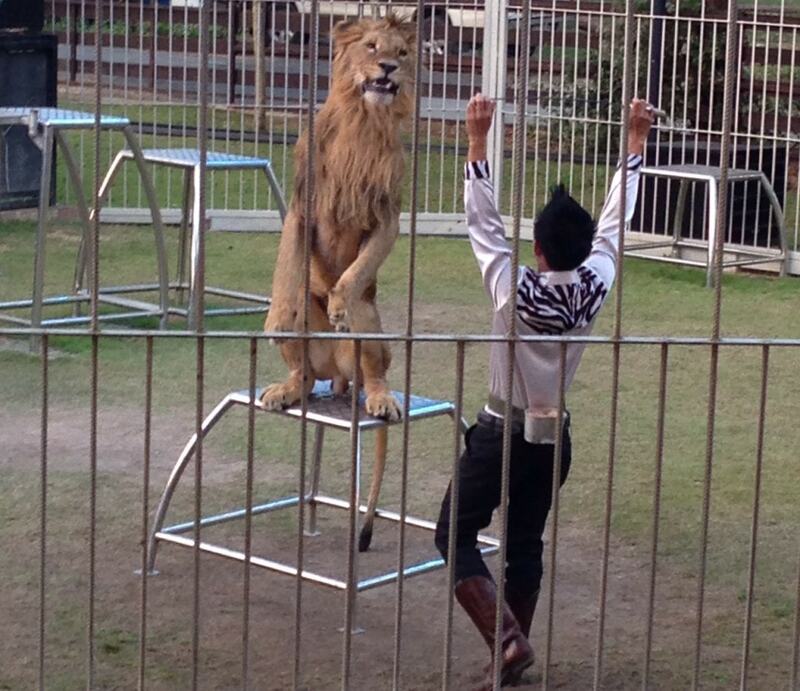 The lion show was intense. While there were no incidents, I was constantly worried the lions would go after the trainers. After the show, it was dark so we went to ride the train through the safari area. Unfortunately, the English train was later on in the evening. Since we still wanted to go to the night market that evening, we decided we would just go on the Thai one. Who needs to hear the commentary anyway? Luckily, we sat by a nice lady that translated things for us. We also bought food (vegetable scraps mostly) so we could feed the animals, we had a giraffe stick his head inside the train, which was exciting and a little scary. After the safari, we headed to the Night Market. The Chiang Mai Night Market may not be as big as other night markets I have been to, but there was still plenty to buy. I really enjoy negotiating prices on things, so I was able to get some great deals on gifts (candles, dresses, jewelry) for friends and family. Another popular thing to do while in Chiang Mai is to visit an elephant camp. Here you can interact with the elephants, feed them, and even bathe them. My friend and I decided that with the limited time we had we would go to the night safari as our animal adventure. Also, we didn’t really bring the right clothes as we probably would have gotten dirty. If you do decide that you want to visit an elephant camp, please make sure you do your research as I have heard that some of the places do not treat the elephants well. The truth about riding elephants is not pretty. We also took a day trip from Chiang Mai to Chiang Rai and the Golden Triangle. Have you been to Chiang Mai? I would love to hear about your experiences. I think it is worth it to splurge and get the private cooking class. That way you can ask questions and go at your own pace. The other “must see” attractions in Chiang Mai are the Night Safari, Night Market, Temples and Elephant Camp. If you plan on going to the Elephant Farm bring appropriate clothes as you will get dirty. When you are planning your visit, here are some more ideas for where to stay in Chiang Mai. PreviousChoosing Accommodation: Vacation Rental or Hotel? Thank you. I hope you get to visit Thailand too. Yes the people are very friendly and we loved the food.